With a new label and a big-name producer, Glorious Fool, John Martyn's first release following his departure from Island Records, looked to be his best shot at mainstream acceptance. Produced by Phil Collins, who was riding a wave of popularity, and featuring Eric Clapton (who had previously recorded Martyn's May You Never) on guitar, the record was his most accessible to date. The album balances the moodiness of the obliquely political title track with cuts such as the muscular drums and guitar of "Amsterdam" and "Never Say Never," as well as the Latin-flavored romanticism of "Hold On My Heart," the slick love paean "Couldn't Love You More," and the haunting, anti-war "Don't You Go." Glorious Fool, the former folkie's second recording in a row to shun the acoustic guitar altogether, bears Collins' stamp (thanks primarily to his drumming and vocoder-affected backing vocals) without ever obscuring Martyn's strong personality. 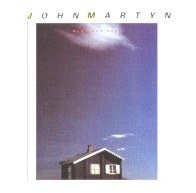 It may not have been the breakthrough some had hoped, but Glorious Fool endures as one of John Martyn's best. Glorious Fool was released in September 1981after John had moved to WEA, who offered him a better deal. The album was produced by Phil Collins, who had recently split up from his wife and the two assisted one another. "We were both going through divorces at the same time, so we just got on. It was great fun, you know, like Heartbreak Hotel, taking turns on the phone...'Darling please'...all that...Everyone's the same!" Collins played the drums again. The album, with its satirical title track dedicated to Ronald Reagan, was a serious bid for the mainstream big time and it charted for seven weeks, reaching No.25. John and Phil Collins produced some new sounds, particularly on the anti-war anthem Don't You Go, where John's voice is backed by a solitary piano and a sustained blow by Collins on the vocoder. John's guitar was hardly audible and his vocals were swamped by synthesisers on a number of tracks. Eric Clapton, who had played guitar on Couldn't Love You More, recorded a version of May You Never for his Slowhand album. Rumour has it that John receives more royalties from this cover version than all of his own albums put together, which John laughingly says is "probably true." John rarely played the acoustic guitar now in his gigs and some fans found this hard to come to terms with. John embarked on a massive 32 date UK tour with Alan Thomson (bass), Max Middleton (keyboards), Danny Cummings (percussion) and Jeff Allen (drums). In August 1981 WEA released Please Fall In Love With Me/Don't You Go as a single.